Centre director Jerry Watkins speaks to Contentgroup about the findings and implications of the Digital News Report. The Digital News Report: Australia 2015 has received coverage in the media, including an interview with Matthew Ricketson, one of the authors, on ABC Radio National's The Media Report. Online articles on the report's findings have been published on Guardian Australia, the Sydney Morning Herald and ABC News . The first-ever Digital News Report: Australia provides a clearer picture than ever before of how the Australian news consumer is similar to and different from 11 other countries surveyed: Denmark, Finland, France, Germany, Ireland, Italy, Japan, Spain, UK, USA and urban Brazil. It is the first in a series of annual reports which will track changes in news consumption in Australia over time – particularly within the digital space – in order to understand how offline and online media are used together. A particular emphasis is on news discovery via social networks, and news consumption via mobile devices. 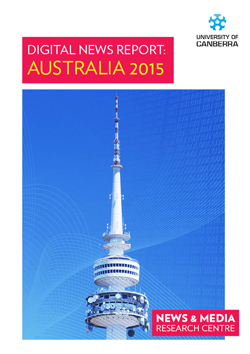 Australia had the highest rate of all countries for accessing news via smartphone (59%). Japan reported only 33% use of smartphones for news despite similar national internet penetration rates. Social media news sources were preferred to print sources in Australia, urban Brazil, Italy, Ireland, Spain and USA. Australians had one of the highest preferences for talking face-to-face with friends about news coverage (54%) – similar to Denmark (58%) and Ireland (52%). Discussing news face-to-face was least popular in France (33%) and Japan (24%). Australians rated the importance of 'international news' more highly than any other country (76%) but rated political news as less important than any other country surveyed (29%). The Digital News Report: Australia is a collaboration between the News & Media Research Centre at the University of Canberra and the Reuters Institute for the Study of Journalism at the University of Oxford. It is available for download in full from Australian Policy Online, the essential resource for policy research.